Many girls are jumping for joy now that MSHSAA recognizes girls wrestling as a school sport even some here at LNHS. 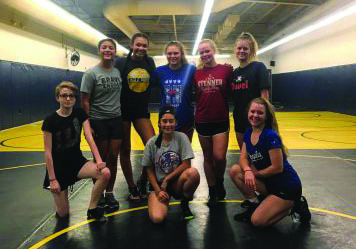 “I think girls wrestling is going to be a really good opportunity this year for girls to try a new sport and I think it’s going to be really fun,” freshman Vivian Anderson said. Girls have been wrestling with the boys in high schools all around the KC metro, but now they have their own team and get to experience what is like to wrestle the same gender. The boys are super supportive of the girls season this year and have high hopes for them. MSHSAA is making a lot of girl specific tournaments and meets so the girls can get experience and have a lot of fun with those. They have decided that for the first two years of the program that women can compete with men up until districts. “Our goal is to provide enough opportunities for our female wrestlers to compete against other female wrestlers at each competition. Many of tournament will have men’s and women’s, divisions,” Coach Thomas Goeglein said. Wrestling for many years has been known as a ‘man’s sport’ but now females are able to compete against other females and give them the opportunity to work on strength. Wrestling is a very unique sport compared to the other sports played at Liberty North. “There are 38 collegiate women’s wrestling programs and women have been competing in high school for many years. Wrestling is the closest thing to a sanctioned fight that you can do in high school athletes. When wrestlers compete for its one on one combat,” Goeglein said. Girls and boys have the same expectations when it comes to the mat, to try your best and put all you have out there. “We want to win men’s and women’s conference titles, qualify several wrestlers for state, and come back with medals from the state tournament. We use the same moves and training regardless of gender,” Goeglein says. Goeglein has a high expectation for the wrestlers and he wants what’s best for all of them. Even though women’s wrestling is not yet established as men’s wrestling and with only eight female wrestlers he still wants all the girls to come out and try their hardest. “We have built up our men’s wrestling program over the years. That established foundation will help us grow the program even faster. We have a lot of great female athletes at LN and our goal is to get 25 women out for wrestling this year,” Goeglein said.